The Danish Octo Project, borne out by a group of volunteers in Denmark which produces crocheted octopus toys for premature babies. 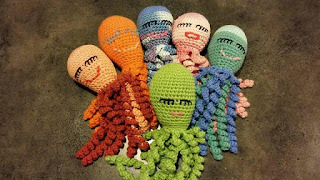 The group says the tentacles of octopus toys resemble an umbilical cord and “remind babies of their time in the womb”. Since its inception in 2013, the Danish Octo Project has made 29,000 for preemies - babies born before 37 weeks of pregnancy - in hospitals across Denmark. The initiative has also spread its arms worldwide with people in 38 countries taking part in the “Octopus for a Preemie” movement. As the tentacles of the octopus simulate an umbilical cord - which establishes the connection between the mother and child - it may give the child a sense of being comforted. However, specific care must be taken to clean the toy and that it may not be advisable for cases where a baby is in an incubator or is very prone to infection.